I want to rant. And why not? It’s the fastest, easiest and most effective way to get your message across especially when people just would not pay attention. Then, place it on some obscure blog in the tangled mess that is the web for better effect. Works wonders. Right? Okay, so that’s probably very inaccurate but what can a girl do? There’s a certain disturbing practice that goes on in Christianity today, it’s so disturbing and so predictable that Jesus had to send us the red light beforehand, like, “I know you’re going to do this but before you do, here’s a tip…” I'm by all means guilty of this also. I remember growing up in church, we were always asked to pray and boyy did I dread those Sunday schools. This isn’t the disturbing part. Wait for it. See, we’d be asked to pray for a long time and well, since there are only so many words in an average nine-year old’s vocabulary, we quickly run out of what to say to God. What do we do? We recycle. Repeat some words and phrases – e.g. “Amen”, “Jesus”, “Help us”, “Please”, “Do this oh, Lord”, “Bless us, Lord”... the list goes on – as many times as humanly possible so we can improve our “time with God”. Now, this isn’t even the major disturbance. Nope. It gets worse when adults – grown-up adults (forgive the tautology, but this is still a rant) – repeat the words in prayers for effect. I mean, really now. How short of words can we get? 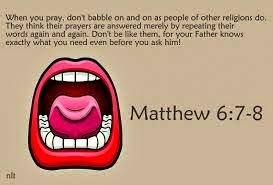 “But when ye pray, use not vain repetitions, as the heathen do: for they think that they shall be heard for their much speaking. Be not ye therefore like unto them: for your Father knoweth what things ye have need of, before ye ask him.” (Jesus, in Matthew 6:7-8). For starters, God is not deaf! Neither is he like that old man across our street whom we have to yell a sentence more than a few times before his ears can pick the signal. I mean, even if we thought He was, why not use sign language or something? Really, who do we think we are yelling at? Secondly, God is not forgetful. We don’t have to repeat instructions (yes, that’s what we do half the time – give instructions) to Him because we’re scared He’ll forget. If we do that to humans, not to God. Third, how many of us, when talking to our very-undeaf, very-attentive friend repeat a sentence or phrase over and again or in between sentences have to keep yelling his/her name while s/he has their eyes and ears glued to us? Really? You do? You need to change your friends. If not then why do this to God, especially after we agreed that prayer is communication, people? Lastly, and most importantly, how annoying do you think it is when a person keeps telling you something you already know? God knows us, my friend. He knows our needs. We don’t have to repeat them to Him before He gets it. Because really, he gets it! And while we’re on that, I didn’t say we should not tell God what we want…noo!! In fact, He instructed we ask! Yet, I don’t think it’s nice when we do things to God we cannot accept or do even to ordinary men. It just goes to show how we view God. Yes, that’s all it boils down to. Our view of God. A God inattentive, unknowing, unreachable. 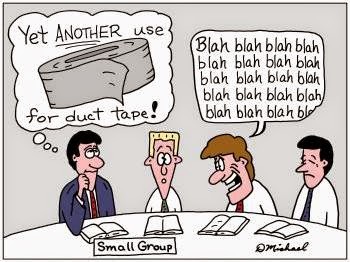 Think conversation! Think fellowship, my friend! “And when you pray, do not heap up phrases (multiply words, repeating the same ones over and over) as the Gentiles do, for they think they will be heard for their much speaking. Do not be like them, for your Father knows what you need before you ask Him.” (Matthew 6:7-11 – Amplified Bible). I told you this was a rant. Ahem. So, sometime ago over diner, one of the guys hijacked the conversation and kept up his monologue for another 5 minutes with the rest of just looking, peering into his eyes and intermittently rendering sighs that suggest comprehension. We in fact did not comprehend and he had lost us on his 5th "shey you get ba?". He finally stopped and waited for reactions that wouldn't come. Everyone just returned their collective attention to their food, quietly. I could see a blush in his eyes. So, for good measure. "Good thoughts", I said. Before everyone, as though on cue, racked up a storm of laughter. It may not be a parallel (certainly isn't), but thinking of our dining table episode in the light of your riveting write, I imagine God looks at us after all our vain repetitions and turns quietly to some other pressing matter (warped, I think). Or sometimes, for good measure, rolls like me and gives a gentle pat that could manifest in any manner (e.g. a goosebumpy feeling). Or sometimes he may just grant our wishes. Or sometimes he throws back his celestial head and laughs with abandon. Or sometimes he answers us the way we want answered. Who knows? Maybe he doesn't even care. Good thoughts though. Frankly, I am inclined to think God does what he wishes, when and how (even with those blahdiblahdiblah). Think of the Parable of the Importunate Widow (Luke 18). A classic example of when chewing out God's hear could paid off. Tis been a while I prayed (the typical head-down doe-eyes hands-clasped model), and I still wonder if I am living precariously. But I guess it's the relationship like you said. I believe that God has a plan for each and every one of us in this world. It is up to us to connect with Him and work with him in order to fulfill HIS will over our lives. I have come to realize that God's plans are far more intricate and perfect than my own. I agree with you that sometimes God doesn't agree with our wishes and he denies them rightfully so. We shouldn't see that as defeat. We should see "unanswered" prayers and "No's" from the Lord as set-ups rather than setbacks. God only wants the BEST for his children. The Bible says to seek ye first the Kingdom of God and these things shall be added unto you (Matthew 6:33). Keep God in mind in whatever plans you make and whatever wishes you have, and success will be the outcome! Oh yeah. God gets it. Thanks for visiting! *Chuckle* Don't I know monologues like that. And yeah, I totally agree that God expects us to persist in our prayers (the persistent widow in Luke as a case-study). What I am opposed to, however, is meaningless repetition of words in prayer. God gets the point. For example, we don't have to call "Jesus" a million times to somehow rouse Him from some miniature deadness...for effect. When I came across that scripture in Matthew 6:7-8, I went like, "Woaah! That's me right there." God cares about our prayers. Every single one of them. He answers them. But in the asking, maybe we should be a little less "babbly" and just be more straight with Him. But then again, it is still a case of our relationship with God. Scripture is clear isnt it we just tend to get stuff mixed up really. I must say i had this view once. And anytime i went off about it i used the same points that you used in your write up. And i must admitt i am not as convinced now about them as i was then. Woah! I'm guilty of this! May God help us all. Really Awesome Post as always. More grace oyin. I see what you mean. But again, the scripture is not opposed to fervency in prayer but to using "meaningless and vain" repetitions. That is, praying in a "mechanical" fashion while believing the effectiveness of prayer is based on its length or outward appearances. It should be "inward-out", not "outward-in" i.e. our passion may at some point drive us to the place where we "groan" but our loud babbling is NOT what gets us the answers. And no, "loud" is not unscriptural. It becomes so when it is mechanical. Well, eventually it's all about finding that balance. Ha!... I know right? Which is why God won't stop teaching us.